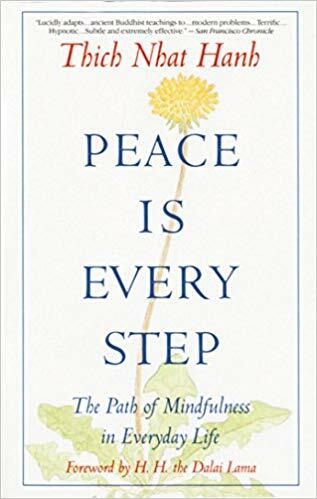 Stressful situations are unavoidable in life, but Peace Is Every Step can teach you how to approach these situations with mindfulness and positivity to ensure that the stress doesn’t affect your physical and mental well-being. This book will help you access the peace and happiness within you by showing you how to stay in, and appreciate, the present moment. We have compiled the advice in this book into a series of habits and actions you can try out from the comfort of your own home! Try even one or two—you’ll notice an immediate positive change in your mood, and over time, your life. Thích Nhất Hạnh is a Vietnamese Buddhist monk, teacher, author, poet, and peace activist who now lives in southwest France, where he was in exile for many years. Born Nguyễn Xuân Bảo, Thích Nhất Hạnh joined a Zen (Vietnamese: Thiền) monastery at the age of 16 and studied Buddhism as a novitiate. Upon his ordination as a monk in 1949, he assumed the Dharma name Thích Nhất Hạnh. Thích is an honorary family name used by all Vietnamese monks and nuns, meaning that they are part of the Shakya (Shakyamuni Buddha) clan. He is often considered the most influential living figure in the lineage of Lâm Tế (Vietnamese Rinzai) Thiền, and perhaps also in Zen Buddhism as a whole. Follow the 14 precepts of the Order of Interbeing.